I can do whatever I want. That’s a popular phrase these days and it is not only for people who win the lottery. Whether it’s a toddler or teenager, the rebellious or retired, this idea that someone can do whatever they want tantalizes all of us. We like the idea of being able to do whatever we want because it gives us the chance to picture scenes in our minds of freedom and happiness without rules, schedules, deadlines and responsibilities restricting us. We might picture a white sandy beach with an umbrella coconut drink and the sound of gentle waves breaking on the sand. Or we might picture a mountain slope inaccessible to most, except for the brave few looking for true adventure. If you had the chance to do whatever you want, would you take some of that time to help others? If you could do whatever you want, would you take some of that time to help someone who does not deserve it? In our Gospel reading from Luke 15, Jesus revealed that when God could spend his time doing anything he wants, God loves to show us compassion when we don’t deserve it. But they were wrong about Jesus. Jesus did not want to spend time with the tax collectors and sinners because he approved of the wicked things they had done. Instead, he wanted to spend time with to save them from themselves. The actions of the younger son are the reason the parable is called the “Prodigal Son,” because prodigal means someone who is reckless or wasteful with money. 22…‘Quick! Bring the best robe and put it on him. Put a ring on his finger and sandals on his feet. 23 Bring the fattened calf and kill it. Let’s have a feast and celebrate. 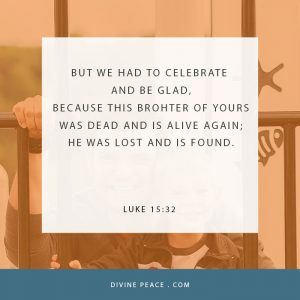 I guess the son took after his father because when most other people would have been ready to punish or at least lecture the younger son, the father said to himself, “I can do whatever I want,” and I want to celebrate the return of my son. loves to show us compassion when we don’t deserve it. 12…So he divided his property between them. 1:18 For the message of the cross is foolishness to those who are perishing, but to us who are being saved it is the power of God. Jesus’ death and resurrection are foolish for those who demand God give them everything they want, but for us who understand the true love of God to save us from this temporary, broken world, the cross proves God’s power to give us life. God has every right to be angry with us for taking him for granted as reckless sinners and self-righteous sons. We don’t deserve his compassion, but that is exactly what he has shown us. His compassion is what we trust in for forgiveness and eternal life. And, His compassion is what we share with others. dead are alive again; we who were lost are found. God can do whatever he wants, and we are thankful to know that God loves to show us compassion when we don’t deserve it. Amen.